Lynnwood, Wash. : Emerald Books, c2005. 197 p. : map ; 21 cm. As a printer, writer, scientist, inventor and American statesman, Benjamin Franklin continually sought to improve himself and the world he lived in, eventually making him the only founding father of the United States of America who signed all five of its most key documents. 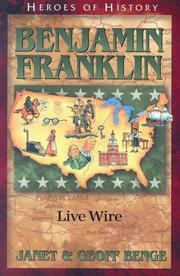 Benjamin Franklin : live wire / Janet & Geoff Benge. 504 BibliogEtcNote $a Bibliography, etc. note Includes bibliographical references (p. 197). 505 ContentsNote 0 $a Formatted contents note Thunder and lightning -- Soap and candles -- The apprentice -- Philadelphia -- An up-and-coming young man -- "Water American" -- Skill and industry -- An up-and-coming businessman -- A civic-minded man -- Scientist and inventor -- Time to retire -- Kite flying -- An official representative -- Everyone was raising a toast to him -- Stepping into the war -- Minister to France -- A useful life. 520 Summary Etc. $a Summary, etc. note As a printer, writer, scientist, inventor and American statesman, Benjamin Franklin continually sought to improve himself and the world he lived in, eventually making him the only founding father of the United States of America who signed all five of its most key documents.